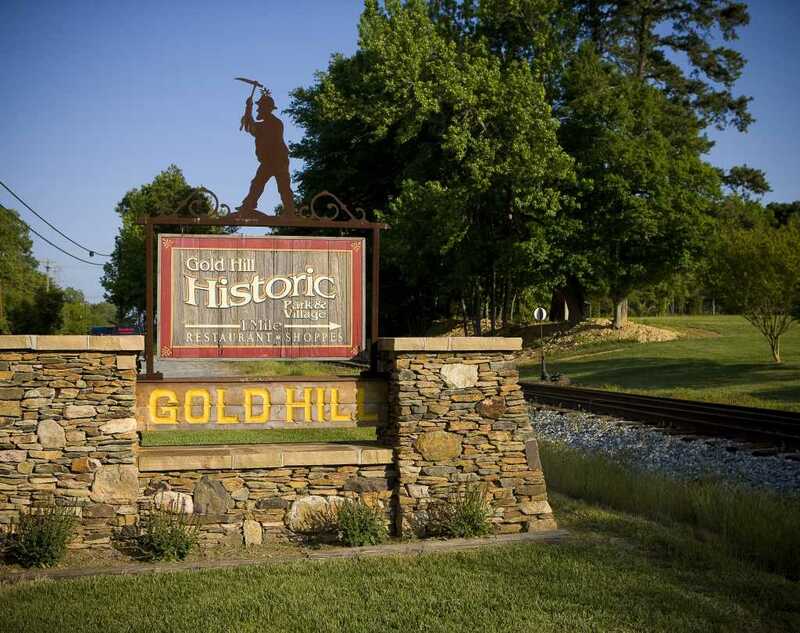 Gold Hill is located in eastern Rowan County, North Carolina just off of US Highway 52, and 14 miles south of Salisbury. If you use Gold Hill as a hub, within a 100-mile radius a wheel forms to take in all the major population centers in the Piedmont and Western North Carolina. So, while this most delightful of small towns in North Carolina is thought to be “in the middle of nowhere,” it is actually In the Middle of Everywhere. From Salisbury, NC: Take US Hwy 52 south approximately 14 miles to Gold Hill. Turn right at the caution light onto Doby Road. Go one block to stop sign and turn left onto US Hwy Old 80. Go one block and turn right at stop sign onto St. Stephens Church Road. Go 1/2 mile to the park on your left or continue straight into the Village of Gold Hill. From Albemarle, NC: US Hwy 52 north for 14 miles. Turn left at the caution light onto Doby Road. Go one block to stop sign and turn left onto US Hwy Old 80. Go one block and turn right at stop sign onto St. Stephens Church Road. Go 1/2 mile to the park on your left or continue straight into the Village of Gold Hill. From Concord/Charlotte, NC via Hwy 49: Take US Hwy 49 North to Mount Pleasant. Continue on US Hwy 49 North for about 4 miles. Cross Little Buffalo Creek, then turn left onto St. Stephens Church Road, then 6 miles to the Village of Gold Hill. From Charlotte, NC via I-85: Take I-85 north to exit 68 (Rockwell/China Grove Exit). Exit the ramp to the Right onto US Hwy 152. Go 9 miles to Rockwell, NC. Turn right at light in Rockwell onto US Hwy 52 south. Go approximately 6 miles to Gold Hill. Turn right at caution light onto Doby Road. Go one block to stop sign and turn left onto US Hwy Old 80. Go one block and turn right at stop sign onto St. Stephens Church Road. Go 1/2 mile to the park on your left or continue straight into the Village of Gold Hill. From Greensboro, NC via I-85: Take I-85 South for approximately 50 miles. Take exit 76 (Salisbury/Albemarle). Take a left off the ramp, following US Hwy 52 south, and go approximately 15 miles to Gold Hill. Turn right at caution light onto Doby Road. Go one block to stop sign and turn left onto US Hwy Old 80. Go one block and turn right at stop sign onto St. Stephens Church Road. Go 1/2 mile to the park on your left or continue straight into the Village of Gold Hill.